These delicious sweet potatoes can be prepared using fresh or canned yams. I usually go for the fresh variety of any veggie especially when they are in season. These yams are so simple to prepare. Thanksgiving morning you can clean and peel the potatoes and assemble the entire tray. Cover it, and set aside until the Turkey has finished roasting. The potatoes can cook at the same time and temperature as the Sausage Sage and Cornbread Stuffing! This is five yams, scrubbed, peeled and chopped into one inch chunks. I had about 16 chunks from each yam. Spread the potato chunks onto a large baking sheet. Squeeze the juice of one lemon over top evenly. Drizzle the maple sugar and top with the brown sugar. Drizzle two tablespoons of olive oil over top of the entire tray and bake in 350 degree oven for total of Hour and half. The first 45 minutes bake covered, flipping the potatos with a spatula several times. The second 45 minutes bake uncovered, flipping potatoes often. Yummy ! 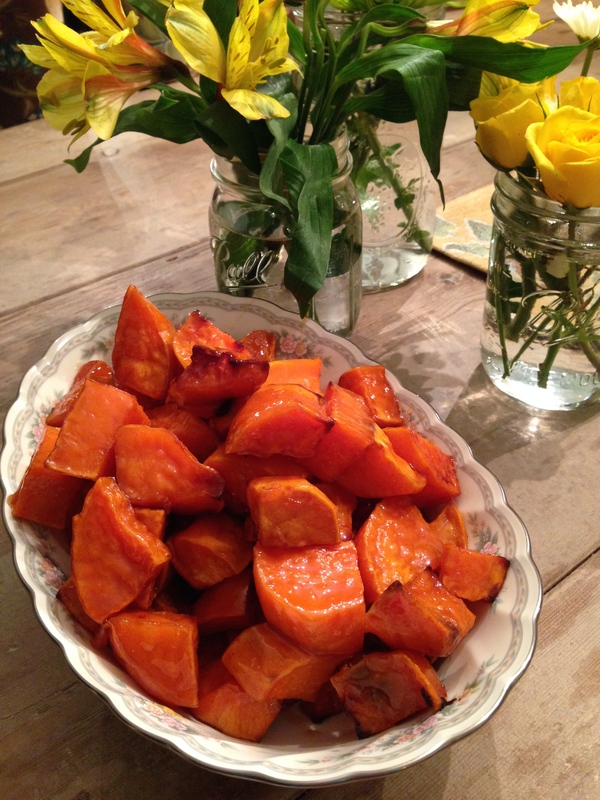 These Sweet Yams will be a hit! These potatoes take longer to bake than the stuffing, but they do cook at the same temperature. It can be tricky to figure out how to cook your sides, as the turkey takes up much of the oven space. You can par boil these potatoes before putting them on the tray with sugar, syrup and toppings. This will cut the cooking time down to a full 45 minutes…the same amount of time it takes to bake your stuffing! ← The Twelve Days Of Thanksgiving!